There are two areas of my practise that I have always struggled to tackle sufficiently, marking and homework. I have talked a little about my new approach to marking here. To sum up I am marking my books every day using Kevin Lister’s #RAG123 system. I am planning to blog about this in more detail at half term but suffice it to say I see the benefits of this system everyday and look forward to marking every book. That leaves homework. Despite what some of my colleagues perceive I am quite a disorganised person. Homework setting, collection and marking is a nightmare for me. Six different classes, 12 pieces of homework (it is set twice a week) and six different hand in dates. I never know whether I am coming or going. I try to be organised, writing in my planner but as a busy head of year things get forgotten, including what homework I have set, and when I come to mark the books the homework is buried amongst work I haven’t had time to read. I then feel guilty when I stumble across an amazing piece that a student has clearly spent a lot of time on at home. I resolve to do better and the cycle starts again. Let me just clarify; I understand the importance of home work. I believe that, if done properly, it can enhance the learning experience for students and teach them to be independent learners. I don’t believe for a second what I was doing was enhancing the learning. I tried to establish a homework routine over the last couple of years. Students in year 9 were given a work book and a weekly schedule of pages to complete. This was to aid their revision for the triple science selection test in January or the end of key stage progress tests in April. I would set it weekly and then every Friday they would green pen their answers using the mark scheme. The second homework was to respond to my marking feedback and green pen their books (correcting knowledge and SPAG errors). I had ticked the “set regular homework” box but I rarely got to see what they were actually doing. They were also completing the same activity every week with a different set of questions. I would be bored doing this. I had a similar system running in year 10 and 11 but it was even less successful due to the fact students are expected to purchase the workbook that they then complete their homework in. I am then in a position where I am setting homework which only 2/3 – 3/4 of the class can do. What do I do with the rest? Good question. Photocopying the workbook would defeat the purpose of buying it and the students who had paid for them would, rightly, get annoyed that this was happening. I could set them a separate task but that would be more work for me and, at the time, I wanted students to be doing the same activities. I could give them a detention but again this was making more work for me, especially when it was week on week that they did not have the workbook. I needed a system that was easy for me to manage and that the students would buy into as well. I read a lot of educational books on my kindle. Amazon know this and provide reading suggestions based on my previous purchases. It was from one of these suggestions that I came across Mark Creasy’s Unhomework. It was the tag line that hooked me “How to get the most out of homework without really setting it.” I finished the book in one day, which is unusual for me as I normally dip in and out of educational books taking what I need and moving on. The principle behind the book is that students decide what homework they are going to do in order to move their learning on. As each child is unique, the tasks they choose to complete are different and the amount of time it takes to complete is also different. What really sold it to me was his account of the students responses when he wasn’t their teacher any more. Students wanting to continue using this method and how it opened up a dialogue with other colleagues who were intrigued by his system. I am currently experiencing this with SOLO taxonomy within the science department so I know how powerful it can be when you find a system the students are endorsing. I was a little bit apprehensive about introducing this new system. It felt too much like a loss of control for me as the teacher. I also worried that the students would take advantage and spend too long completing easy tasks or rushing more challenging ones. I also recognised that starting this system in June was probably not the best idea so I decided to spend time thinking about it in the summer and possibly introduce it in September. About the same time came my twitter epiphany. Twitter as CPD – amazing. I observed a couple of the people I was following use the hashtag takeawayhmk and it lead me to a blog post from @teachertoolkit. If you don’t follow Ross on twitter or have not read his blog – you need to! As far as I’m concerned it should be compulsory reading for all teachers and educators. Teachertoolkit.me was one of the main blogs that inspired me to start blogging about my own learning experiences as a teacher. You can find his article on takeaway homework here. Takeaway homework is simply a range of different homework tasks of varying difficulty laid out like a takeaway menu. I realised that I could still use the unhomework principle with my students but in a slightly more structured way that gave me that sense of control. It also, importantly, provides structure to the students on the type of tasks they can complete. I googled the term takeaway homework and found a number of teachers and schools who were already using this as a method of setting homework. I found this example from Mr Collins. I thought it was great that he had created a power point to explain what was expected for each task but as a scientist I wanted to see an example in my own subject area. I then found a science specific one here on the TES resources website. I had found the two menus I was going to use with my students. The first one would be for KS4 and the second one for KS3. I wanted to trial both menus to see which was more appropriate for the students at my school and to get a better range of tasks completed. My next challenge was to work out how they were going to complete the homework. As I said at the start of this post I am #RAG123 marking their books everyday so they would not have their exercise books. Bits of paper did not fill me with joy as it is too easy to loose and more prone to the “i left it at home” or “my dog ate it” excuses. In September 2013 my school moved over to use google apps. All our email addresses were ported over and all staff and students have a generous storage on the google drive (like dropbox). In the summer google expanded their apps range to include classrooms.google.com. Any educational institute signed up to google apps can use google classroom. It extends the functionality of the google drive by providing a way of setting, tracking and marking assignments for all students in your classes. You have to set up each class with the list of students and their addresses. This isn’t too painful if you have a global address book set up so you don’t have to manually type every student email address. What you can then do is set homework for each class and provide detailed instructions of the task, attach resources, templates (it will even make a copy for each student if you want them to complete a specific sheet) and allow you to set the date AND time the task is due. Students can then complete the task within one of the range of google docs available or upload a document to the task page (like a microsoft document). Once they click “hand in” you are notified via email and, if a google doc, it switches the student to view only so they can no longer add any further comments. You can also email the whole class or selected individuals from within the app and can post private messages to individual students about the work they have completed. This was the solution to my problem of where to do homework. Students cannot use the excuse “I left it at home” or “the dog ate it”. We have plenty of ICT facilities available so students who claim “my internet is not working” can be directed to complete it on site. It also saves trees as the homework remains in the cloud unless I want to print it out for display or as an exemplar to other students. I don’t ask students to print out their work as this would use their print credits. The other beauty of this system is that the setting of homework is documented so they cannot claim I wasn’t in the lesson or I didn’t write it in my planner. Google classroom creates a folder on your google drive for each student and all their homework is automatically saved in this folder so if anyone wants to see evidence of the homework it is immediately accessible. It is now 4 weeks into term and I have introduced takeaway homework to all my classes. The majority of students gave a positive response to the change. They were really enthusiastic at being given control over what they did. A couple freaked out over the lack of structure and needed a little bit of additional support before realising they could do it. A couple of tweaks I have made to my system. All homework is due on a Friday, regardless of when I teach the class. This is my personal preference as I don’t have to think about which class they were in and when it was set. I have two deadlines; 4pm for physical hand ins for tasks that cannot be completed on computer or for those students who have not, for what ever reason, been able to get onto a computer to do it electronically. 11:59pm for electronic tasks, for some reason students like to be able to hand in their homework after school has finished and it gives them that additional reminder in my final lesson of the week before my deadline. I know this gives me a chunk of marking for the weekend but as my books are already marked it is less of a burden than it sounds. Also as I get emailed when tasks are completed I can mark a piece as soon as I receive it rather than waiting to collect 28 pieces at the same time from each class. When I told my head of department of my plans he was very supportive and interested. His first question was “How are you going to mark the homework?” #RAG123 solved that problem for me. The students are already familiar with this marking system so it makes sense to continue using it for their homework. I give an RAG for understanding of the science and of the task. G= Excellent subject knowledge and matched the task brief, A= either gaps or mistakes in subject knowledge or work does not match the task brief, R= significant misconceptions in subject knowledge or incomplete task. 123 marks the level of effort placed into the task. So a 1 would be the work is their own or significant effort has been put into the task 2 would be work “found” on the internet but referenced or fair effort has been put into the work 3 would be work copied from somewhere else or little effort has been put into the task. I then suggest a way the student can improve or extend the task they have done. 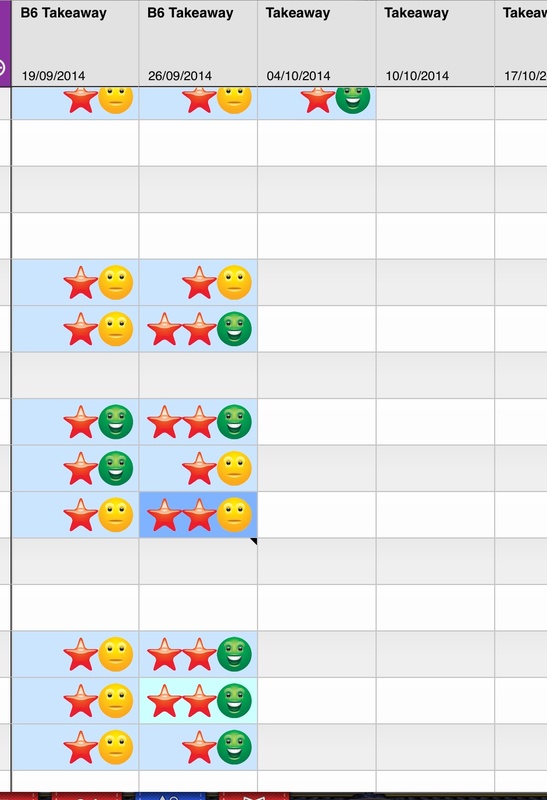 Finally, thanks to Kevin Lister (@listerkev) and Mohammed Ladak (@mathedup) I use the ipad app Idoceo to record the marks I have given to each student. So far it is has been a liberating experience. I have enjoyed marking all the pieces of homework handed in and it has not felt like a chore or a burden. The students appear more engaged, handing in homework the day after it was set. Some have requested to complete a task not on the menu. Some have asked if they can work together and negotiated the task and the number of chillies (difficulty rating of the task). All students have been set to achieve 12 chillies by half term. Even this can be differentiated according to the student. 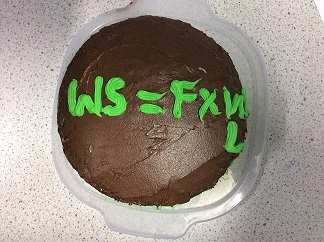 I have had web sites, posters, tweets, diary entries, raps, poems, presentations and even chocolate cake (see below). I still have a number of students who have not done my homework but now I am better organised with the setting and collecting of it, I can dedicate more time to chasing these students up and, hopefully, support them in developing better homework habits. Year 10 student’s takeaway homework after a lesson on seismic waves. Thank you. I’ve realised that clarity & consistency are really important. Will do an update at half term about how it has gone.